the J.Doe Project is having a farewell send off to the Healing Doe "One Nation Under God" which is being donated to the City of New York via Catholic Charities. The event will take place at Composite Structures 6200 N. 16th street on Wednesday, July 24th , 2002 at 1:30p.m. The artists that worked on the Doe will be in attendance as well as some of the J. Doe committee, Don Dobson from Composite Structures, Tom Janssen a representative from Senator Hagles office, a representative from Lee Terry office, ABF Trucking representatives, Scott Adams from Catholic Charities, and a Company of Fire Fighters. 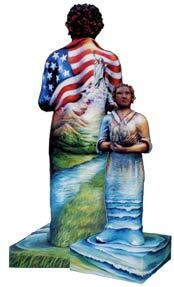 The fiberglass figure and the crate were donated by Composite Structures, the artists donated their time and materials, ABF Freight System, Inc. are donating the transportation from Omaha to New York, and Catholic Charities has agreed to accept this gift for the people of New York City in response to the 9/11 incident last year.